Heidi has more than 25 years experience in public policy, communications, and collaboration with non-profit organizations, businesses, academia and government agencies. Her background includes facilitating consensus-based solutions with government agencies and the public on issues ranging from California water issues, public lands grazing, natural resources, transportation and community and environmental planning. 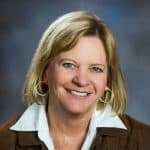 She has expertise in the implementation of collaborative solutions, which make her especially suited to the role of CEO and TPC’s mission of uniting Tahoe’s communities to strengthen regional prosperity. Heidi came to Lake Tahoe in 1995 to snowboard for the season. Growing up in Florida, it was definitely supposed to be just one winter. But she fell in love with Tahoe, got married and had two Tahoe boys. She has worked at Sierra-at-Tahoe, the League to Save Lake Tahoe and the Center for Collaborative Policy, at Sacramento State. She and her husband John are raising their boys to be as active and engaged in the community as they are.